Doctors are urging the federal government to protect children when marijuana becomes legalized. The Canadian Paediatric Society gave a report to the federal government asking for age restricted sales and limits for THC levels in pot accessible to those under 25. The report cited health and lifestyle risk reduction in limiting potency to products available to young adults. Anti-poverty workers are concerned the new child tax benefit isn’t adequate to help Canadian families combat the rising cost of food and housing. In a report to the federal government, the group Campaign 2000, says fewer families will be eligible for the benefit by 2021 as family incomes rise. The group says the federal government must make changes next year to build the country’s fiscal capacity and address the growing divide between the rich and the rest. A pediatric doctor and a health administrator are looking into how four indigenous men from northern Manitoba were switched at birth 40 years ago. Federal Health Minister Jane Philpott promised the review after two sets of men came forward following DNA tests. The tests showed they had been sent home from Norway House Indian Hospital with the wrong mothers. 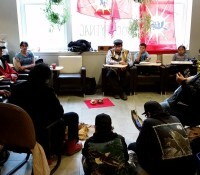 Mi’kmaq chiefs in Nova Scotia accepted an apology from Premier Stephen McNeil for a controversial government legal brief that implied members of a First Nation band are a conquered people. McNeil made the apology Thursday during a meeting between chiefs and the provincial cabinet at the Nova Scotia Archives. Membertou Chief Terrance Paul said the chiefs have accepted the apology and we are very fortunate to have a government that is willing to listen to the Mi’kmaq.